Harry and I have been learning about and growing organic grapes for several years now. We have a few varieties, red Vitis labrusca and green Interlaken grapes, Vitis labrusca uva variedad Interlaken. The grapes grow along a split rail fence in full sun. In 2008, my online article with recipe, A Beginner's Guide to Making Jam or Jelly, was published on Dave's Garden. It's been popular, with over 17,000 people reading it so far. This year I added another sequel about our jelly making adventures. 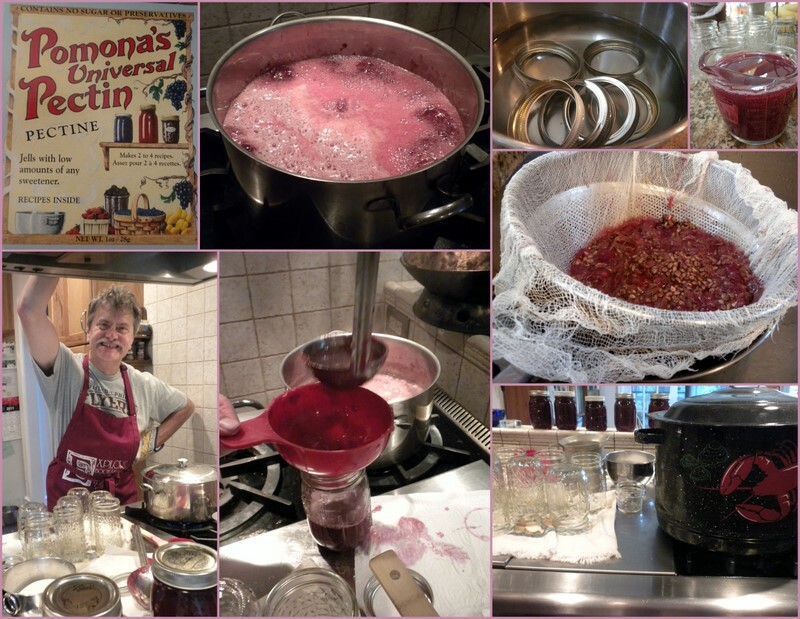 Our late summer red grape harvest inspired us to make jelly again, only this time we made it with much less added sugar. And...yes...it gelled! (yay, a big achievement for us). The lower sugar jelly tasted plenty sweet and delicious too. We were able to cut half of the sugar from our original recipe by using a type of pectin that does not depend on using high added sugar. Read more about it. I'm glad Connie Sumberg, partner in Workstead Industries (Pomona's Pectin) approves! Pomona's Pectin, For Jam & Jelly "I am very impressed with your article: lovely pictures & a well written, correct jelly making process. When using concord grapes, I would highly recommend letting the juice sit overnight & then pouring it off without the sediment. Crystals in your jelly are like pieces of glass." Photo collage and blog article Copyright ©2011 D.Wind. All rights reserved.